Last week I popped into Boots and did a little makeup shopping that I felt was very Autumn inspired. So I thought I'd share it with you today! 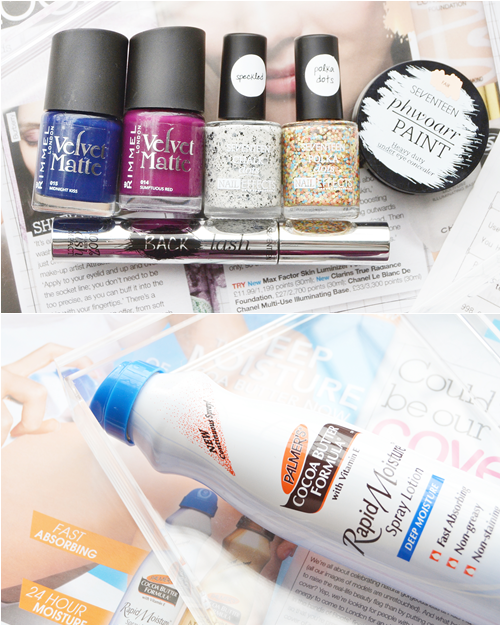 First in my basket were two of the Rimmel Velvet Matte nail polishes I featured in a recent wish list post. 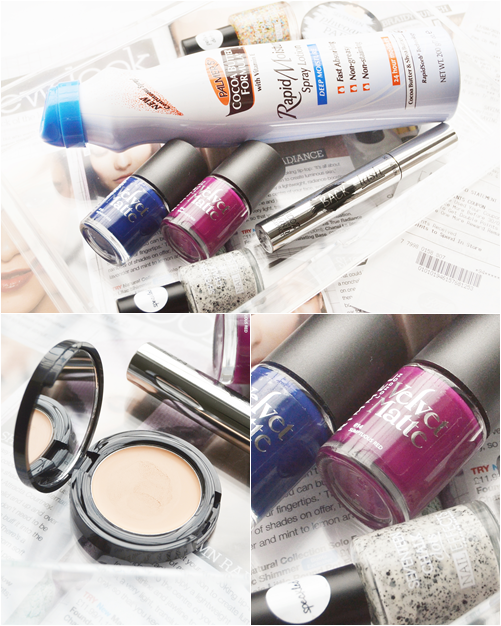 These were very blogger enabled purchases as I've seen so many swatches of the new range and loved the softer matte finish along with the rich autumn/winter tones. Expect a couple of NOTD posts with these soon as they are gorgeous! As I've been loving the Palmers Cocoa Butter Body Oil recently I thought I'd try out something else from the brand. The Rapid Moisture Spray Lotion instantly caught my eye as 1. it was on offer and 2. however strange this may sound I thought the packaging was very American... which I liked! I've already tried this out and know I will love it as it's got the wonderful cocoa butter chocolate-y scent I love and the spray application makes it so easy to apply. I then came across the Seventeen stand and literally felt I was spoilt for choice as they have so many new products out at the moment. I was instantly drawn to the top coat nail polishes especially this one as it reminds me of Oreos and cream. I also picked up a lovely multi-coloured polka dots top coat that even though isn't very autumnal will look good over so many nail polish colours. Also I haven't seen anything similar to this on the high street. Currently when you purchase 2 Seventeen products you can pick up this free mascara which is worth around £6! Not too bad at all. Last but not least I picked up a concealer that I've been wanting to try for so long now. Unfortunately I have quite dark circles/veins under my eyes and my beloved Collection Last Perfection Concealer just wasn't cutting it. So after seeing some great reviews of the Phwoarr Paint I thought I'd try it out. So far so good with this, much more creamier for blending and it definitely gives better coverage. Let me know what you bought last in Boots!